I’ve been spending the last month or so setting up, honing, and dialing in our Google Pay Per Click (PPC) strategy. I have a few thoughts on this experience that I’d like to share and see what the current conventional wisdom might be on these topics. A little background – we’re decidedly in the “long tail” camp of online advertising, which means we’re going after search terms that are very specific. We’re not bidding on keywords like “cheap software” or something that would broadly appeal to all consumers. Our target market is training companies who need software to help them manage their training businesses. Search terms like “training management software”. Even terms like “training business” are much too broad for us as this would usually refer to people starting a personal training business, and while they could use our software, we’re more geared to the type of training company that delivers many different classroom style courses (online and offline). Is Google Adwords Designed to Scam You (or at least Mislead)? Google’s motto is famously “Do No Evil”, but I believe that the way Adwords is configured by default is designed poorly at best and possible designed to flat out scam you. Let me explain. When you start a new campaign and begin adding keywords, Google accepts keywords you enter as a “broad match” type, which their documentation describes as “synonyms, related searches, and other relevant variations”. This is totally reasonable on the face of it, and I’ll bet that most if not all campaigns get started with these parameters. They’re the default and everyone would like to include synonyms! Here’s the problem – Google buries the only way to sanity check which keywords your campaign is actually being clicked through on in a very hard to find option. They also don’t update these stats until 24-48 hours later, when every other stat available through Adwords seems to be updating hourly or better. What does this mean? It means that the default report you see which shows your keyphrases and the clicks via those keywords is not accurate – users aren’t actually clicking on those keyphrases, they’re often clicking on things that have almost zero relevance to your campaign particularly for those campaigns that are designed to go after “long tail” keywords. Instead of showing you the real keywords that you’re paying for, Google hides these away on another report in a dropdown menu labeled “Keyword details”. Google repeats this tactic of (at least from what I can see) in not allowing you to whitelist display network sites. They allow you to select sites on which you’d like to run your ads, but they also require you to run on “automatic placement” display network sites which were all 100pct irrelevant and probably would be to most companies. Sites like screensaver downloads, free software download sites, or a wide variety of other sites that seemed designed to be Adwords honeypot properties. From what I can tell you can either disable all display network advertising, or login every day and manually “Exclude” sites where you’ve potentially wasted money the previous day. Why does Google do this? It’s clearly in their interest to extract as much revenue as possible, but the thing that’s weird to me is the entire approach here seems to be designed in a way to ensure a negative customer experience, at the expense of a few bucks of revenue. Consider the client who doesn’t care, has unlimited budget, and wants to blast out to as wide an audience as possible – let him start with a specific audience, then suggest that he loosen up his criteria and increase his spend. In fact, Google already has this tool – their “Opportunities” tab. The flip side is the long tail client who without really careful exploration and attention is going to get hosed. I’m sure there are millions of small adwords advertisers (mostly small businesses) who are getting taken for a ride and will never know it. 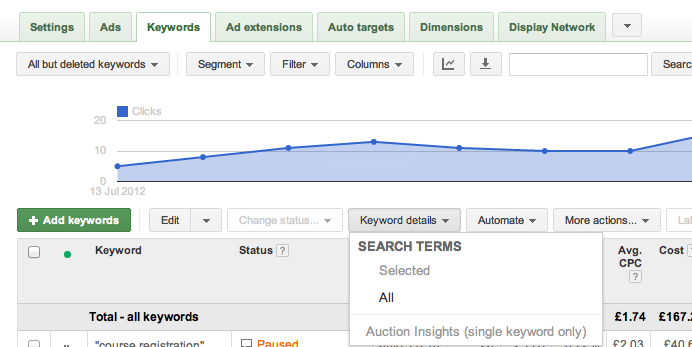 At the very least, the keyword clickthrough report should have a one-click drilldown to the actual keywords clicked to help users see and hone their campaigns. I mean, certainly this is one of the most valuable reports (if not the most). This report only increases in value as you widen your net of keyphrases. Why effectively hide it? Because you might rethink your spend when you see what you’re actually paying for. Another really annoying thing possibly designed for lockin reaons (although probably just an oversight) – you can’t export your keywords. Yes, it’s true. You have to “spreadsheet edit” then copy and paste them out. It’s a really uncomfortable feeling to know that you’re bidding on keywords within Google Adwords while trying to optimise for those same keywords via Google Webmaster Tools. This is a massive conflict of interest and Google would be well served to break these into separate companies or at least detail what kind of protections they have in place to prevent the obvious issues that could crop up should the teams begin to collude together. Google allows you to pay for ads based on conversions, which is something we haven’t experimented with just yet, but on the face of it seems like a good idea. Good fora business and for Google as in theory it makes click fraud irrelevant. Who cares if they fradulently clicked the ad as long a they didn’t buy your product? Since we’ve been live, we’ve noticed 1-2 signups per week that come with good names, reasonable email addresses, and plausible phone numbers. Some of the phone numbers are even real, but are innacurate. I’m pretty sure these are due to click fraud that’s designed to earn money for sites that get paid based on conversions. If you’re a site owner, you won’t know how your ads are being paid for but it’s a good bet that no matter what a “real signup” will look less like click fraud and could net you a few extra bucks. I’m not sure what the best solution here, but I am sure that click fraud is probably responsible for at least 10pct of clicks (more for higher value products or “shadier” industries). I wonder if Google releases its suspected rate of click fraud over time? That would be really interesting. The alternatives to Google Adwords seem to be Facebook, LinkedIn, and Bing (which services Yahoo as well). Bing’s ad platform doesn’t work with Google’s Chrome browser. Their coupons they send you for free ad credit upon signup don’t work for companies outside of the USA. Fail. LinkedIn’s ad platform currently has a bug where your ad previews don’t work for reporting or management purposes. This means you stare at a report of metrics by ad and can’t actually see which ads are generating those metrics. You have to clone the ad, then cancel, then go back to the report to even see which ad your stats are referencing! LinkedIn also only lets you target based on things like title or group associations. You can’t actually target companies by any kind of meaningful industry criteria from what I can tell. It’s genuinely bizarre. Their tool also has about 1/10th the information that Google’s platform gives you. Each of these is unbelievably painful compared to Google’s options. It’s really hard for me to believe that multibillion dollar companies are built upon these platforms (exception of Bing), or at least see them as their route to profitability. If an entire generation of techies gave their lives to these platforms, they should be ashamed of themselves. I haven’t setup our Facebook campaign yet, so we’ll leave them aside just now. The really sad thing about this, is there’s very little chance of Google getting dethroned or even having someone to compete agains in the next couple of years. It’s possible mobile ad networks will provide some heat, but it seems really fragmented and Google already targets these through its existing Adwords tools.